Let’s talk about what all-inclusive tuition means. All-inclusive tuition means that your money covers more than just the great education you’ll receive from our industry expert professors. It means that your tuition includes the cost of all books and supplies necessary to be successful in your classes here at Wade College. It means no hidden fees, no surprises later. It means you can make an accurate financial plan for your educational investment. It means that all new students receive an iPad, that they’ll use to access and annotate e-books, keep track of upcoming events and volunteer opportunities, face-time with family and friends, set alerts for impending due dates, find inspiration, create concepts and designs, and maybe even find a few moments to take a perfect college selfie (venti latte, notes, glasses, study-face: check). All-inclusive tuition means your professors have carefully curated a supply list for each class. If you’re studying Fashion design, you can look forward to receiving a beautiful full set of Tombow dual-brush pens for your illustration courses, a professional designer starter kit, and gift cards of up to $200 values per class to Golden D’Or Fabrics, a local store of over 35,000 square feet full to the brim with fabric choices. 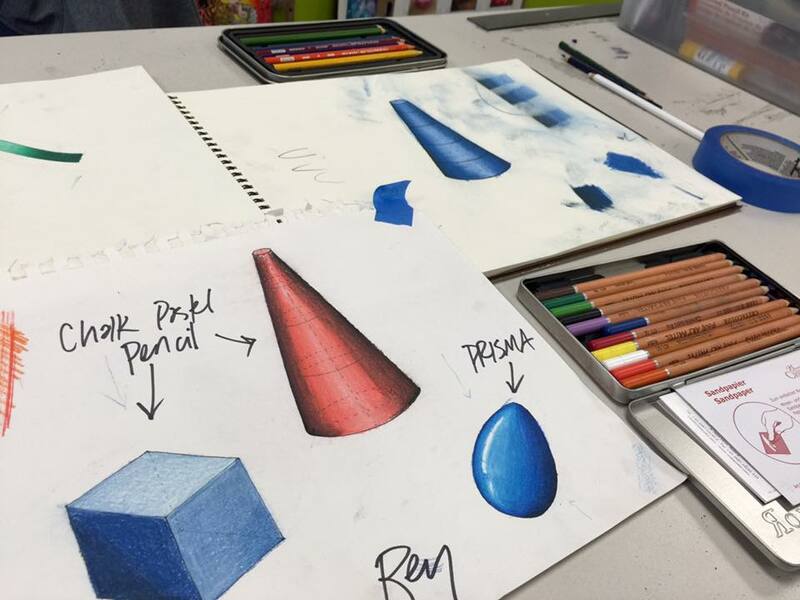 Interior design students receive supplies ranging from PrismaColor pens and pencils, to drafting vellum and large-scale plotter print capabilities. If you’re a visual communication student, you’ll receive essential textbooks and tools like Apple Web Developer for app design, and in your studio drawing and design courses, you’ll use supplies ranging from oil pastels and India ink with calligraphy nibs, to water color pencils and plaster of Paris to help you learn a variety of new techniques. Merchandise Marketing & Management students will gain a personaly library of essential industry texts in subjects ranging from branding to social media marketing. And all students in their graduating trimester will receive a sleek onyx portfolio book from Pinazaqngaro to professionally display their achievements to future employers. Finally, our all-inclusive tuition rate means that you can use your last few before classes to pick out a dynamite first-day outfit, or enjoy some R&R, rather than frantically scrambling through used book store shelves hoping to find the Holy Grail – a barely used, up-to-date edition for a fraction of the price the college textbook store is charging (Hint: you won’t find it). It means you can spend your time preparing yourself for the adventure you’re about to embark upon. It means on day one, you can relax. Bring a spiral notebook, a pen, and a passion to learn about your industry, and we’ve got everything else covered! If you’re a visual communication student, you’ll receive essential textbooks and tools like Apple Web Developer for app design, and in your studio drawing and design courses, you’ll use supplies ranging from oil pastels and India ink with calligraphy nibs, to water color pencils and plaster of Paris to help you learn a variety of new techniques.